The roof is one of the most important parts of your house. It protects the inhabitants and all items found inside the building against the elements such as rain, winds, and sun. Without the roof, criminals would have an easier way of entering the building to steal or cause bodily harm. These reasons explain why it is important to take good care of the roof. A roof that develops a few problems, need repair. If the damages appear irreparable, the best thing to do would be to replace the roof. As a homeowner, what you can or cannot do while repairing the roof should be information that you have in the palm of your hands. For example, prior to the repairs, the roof, gutters, and rafters must be cleaned thoroughly. The top parts – at least – need thorough cleaning to make it easier for the individual tasked with the repairs to see where the problem is. High winds, pounding rainfall and storms have the tendency of damaging shingles on the roof. 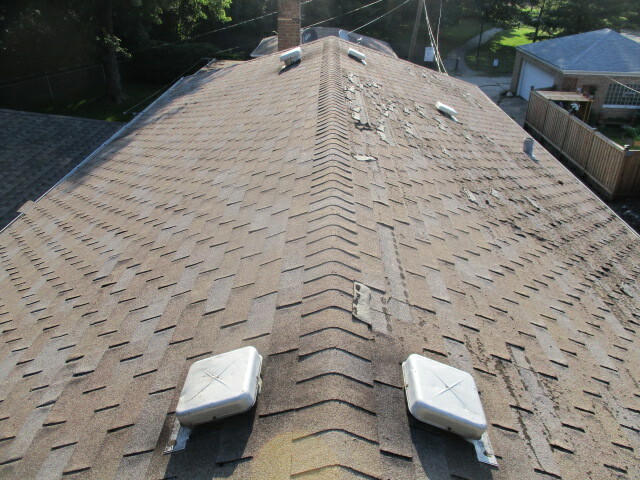 The damaged shingles need replacing, especially if they have fallen off too. It is important for the roofer to know what to do about fallen gutter. A fallen gutter does not have to be replaced. What it needs is to be placed back from where it fell. While at it, you should keep a close eye on branches and limbs from the trees surrounding the building. One of the worst things you can do is to leave the hanging branches and limbs as they are. Therefore, remove the branches, as they are notorious for damaging roofs and gutters. If you fail to remove them, be prepared to do more repairs in the coming weeks or months. One of the tasks you should never attempt to do on your own is replacing a damaged roof. Do not forget that you can fall to the ground and suffer injuries as well as broken limbs. For this reason, you need 1-2 people with whom to work. Working on the roof often means climbing a ladder repeatedly. You need somebody to hold the ladder for you. In fact, any repairs that the roof needs should never be done by one person. Where roof repairs are concerned, two or more people involved in a single project are not a crowd. Some of the most sensitive parts of the roof are the areas around the skylights, chimney, and any other open portion. If you are not careful, you might slip and fall off from the roof. Many people end up damaging the chimney and skylights because of failure to exercise caution. Therefore, avoid tarring or fixing the damaged parts around these areas. In addition to this, never put a metal roof on the building by yourself. Similarly, installing a new gutter system while repairing the roof is something you should do with others and not alone. It is good to do work that you are comfortable and feel safe doing. Nobody knows your skill set better than you. Take time to know the risks associated with each work first. Know what is expected of you. Identify the best ways of doing each project – just in case you lack the finances needed to hire a professional roofer. Roof repairs and replacements are dangerous jobs. They are dangerous to you and the building. They are risky to the inhabitants and visitors too; thus, the need for doing them tactfully and with full confidence in your abilities, or lack thereof. There is no shame in hiring an experienced roofer to do the repairs if you find them complicated.